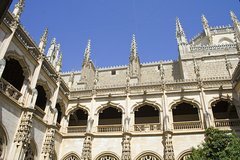 Enjoy this day trip from Madrid to Toledo, where you will receive a traditional lunch and a guided walking tour. You will also be able to enjoy a panoramic mini-tour by bus, which will give you great picture opportunities. Discover with us the city of the three cultures. The perfect option to enjoy the best of Toledo in one day without losing detail of the most emblematic places. Tour begins by bus from our offices located in Ferraz 3, street. After approximately one hour journey, the experience starts with a walking tour through the historic center of the city, considered a National Monument and declared a World Heritage Site by UNESCO. It has magnificent examples of architecture from different eras and styles: Mudejar, Romanesque, Gothic, Renaissance, Baroque ... that left as a legacy the different cultures and civilizations that lived within its walls. You will discover with our expert local guide these and other details of this wonderful destination.